Cegid, a pioneer in the digital transformation of the retail sector, continues forward on an endless search to provide guidance for the challenges and issues facing retail businesses. In 2010, this mission was translated into a new concept: the first Cegid Innovation Store in Lyon. This one-of-a-kind connected showroom with the outward appearance of a boutique brings together the latest innovations by Cegid and its partners, all designed to offer enhanced customer experience and an optimum buying journey. In an era of unified sales marked by offline-online convergence and the growing number of touchpoints on shoppers’ paths to purchase, it is essential to seize all sales and growth opportunities through maximum efficiency in retail, in-store and back-store solutions. Cegid now presents the 3rd edition of the Cegid Innovation Store, unveiling the very best of what retailers have to offer their customers. Consumer standards continue to rise, producing clientele that are ultra-connected, with faster access to information in search of rich and personalised experiences. To meet such expectations and always stay one step ahead of their needs, retailers have resolved to put the store through a total transformation. For Cegid, an efficient store acts is a connected hub, the center of a unique retail ecosystem where many streams are managed. This includes customer traffic, of course, but also proper management of merchandise – product availability, purchases, shipments and returns – as well as detailed information on the customer’s online and offline sales path. For all of this information to be properly classified, exploited and shared with the correct parties, the brand must be equipped with the right tools to offer the optimum experience to its customers. In addition to the rich experience brought to the customer, the digital transformation of bricks-and-mortar retail enables store associates to add even more value. With innovative mobile tools that improve the flow and management of all the operations of a point of sale, retailers can reach their highest potential. These tools increase the emotional intelligence of their relationship with shoppers, providing the means to be the most relevant, bolstering expertise and gaining greater insight into a customer’s habits, such as preferred method of delivery or most-purchased products. Every year, many retail professionals from all over the world visit the Cegid Innovation Store to identify what will help them increase the value of their business, drive in-store conversions and – of course – contribute to the growth of their business. To offer industry professionals today’s top innovations, all gathered in one single place in France, Cegid is joined by 25 partners including both start-ups and major brands such as Aures, Adyen, Epson, Fréquentiel, HP, Microsoft, Nedap, Stackr, Valtech and Zebra. The Cegid Innovation Store’s 3rd edition is concrete proof that establishing a complete, connected and smart hub must become the norm. This vision comes together with the unification of offline-online channels, particularly in the field of inventory control, to forge a continuous customer relationship that stays seamless along the entire buying journey. 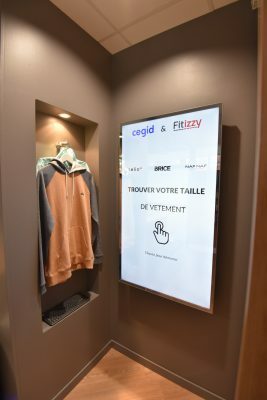 The Cegid Innovation Store also highlights solutions like mobile payment, RFID for checkout and inventory management, and the ability to analyse customer interactions regarding their purchase experience on social networks or other digital channels, as well as products identified or purchased. All the applications on display in the connected showroom have already been integrated into Cegid Retail, Cegid’s omnichannel platform for managing customers, sales, products, in-store human resource services, as well as the “Shopping-Customers-Catalogue” trio, the new in-store omnichannel solution developed by Cegid. Continuing to push the envelope on digital transformation, the Cegid Innovation Store also appears in the form of pop-up stores all over the world, endlessly updated as new innovations emerge. More than 1,000 brands and 70,000 connected shops worldwide rely on Cegid’s retail solutions as the driving force of their daily operations, helping to seize new growth opportunities in the age of e-commerce ensuring retailers never miss a sale.